If you're like me, you hope your favorite button down dress shirt will last forever. Unfortunately, they are typically made of cotton, not Kevlar, so they do wear out and break down over time. Some of the problems you commonly encounter can be fixed while other symptoms indicate it's time to retire the shirt and purchase a new one. The International Fabricare Institute expressed that cotton button-down shirts are designed to withstand 52 wearings and cleanings. That's only once per week for a year. If you've had your favorite shirt for 5 years and you've worn it every other week, it's living on borrowed time so treat it kindly. Below are some of the more common problems with laundered shirts. Here you can see the edges and tips of this collar are wearing out. What causes this? It's normal wear and tear caused by wearing and cleaning the shirt. 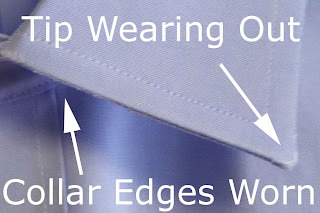 Also, tips can wear faster than the rest of the shirt if it's a straight tip collar (vs. a button down collar). A typical dress shirt is made to withstand 52 wearings (and subsequent cleanings). If you notice any of these things before that time, talk to the manufacturer or cleaner of your shirts. 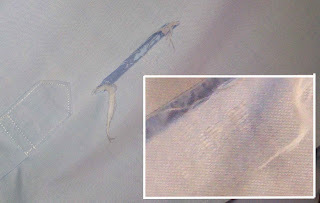 The picture on the right shows a torn sleeve on a men's dress shirt just above the sleeve placket. Closer inspection shows the area that isn't torn but rather is worn; it's a yarn failure caused by rubbing or chafing from the elbow of the wearer. Don't believe me? While wearing a button down shirt, bend your arm and look where your elbow is - it's right above the sleeve placket. Yarn Failure is most common on striped shirts; you'll see one of the colors in the stripe give out while the other holds strong (it sometimes looks like fading stripes).Looking at the inset of the picture above to the right, you can see the yarn is giving way and will create a hole soon (I know this shirt isn't striped, but it still illustrates yarn failure). The shiny tips of this dress shirt are caused by the construction of the shirt. When shirt collars are made, they are glued together, then sewn. When washed, the glue is not supposed to be visible. With some of the new wrinkle-free shirts, this isn't always the case. Sometimes you can scratch it off, but a quality dry cleaner can sometimes remove these for you without abrasion (sometimes there is nothing that can be done). The front of the shirt can shrink along the buttons, button holes, or both - it looks like it's all bunched up. The cause is either not using material that was pre-shrunk from the factory or using the wrong kind of thread to make the shirt (the thread shrinks, but not the body of the shirt). White shirts turn grey over time because they weren't actually white to begin with, they're a greyish color masked by optical brighteners. As you wear and wash the shirt, the optical brighteners are washed out with the dirt and stains leaving the shirt looking dull and grey. If you shirt is 100% cotton, and in good shape otherwise, it's possible to add new optical brighteners, a professional dry cleaner will be able to give you more information. Typically a yellow spot is an oil or grease spot that's been ironed or pressed. The oil can be from food (salad dressing is a big source) a door hinge. Typically the oil is clear until heat is applied, then it turns yellow. It's tough to get these spots out, but most good dry cleaners will know how. Sometimes yellow spots can be caused by soap that isn't washed out. The solution here is to simply re-wash the shirt. Broken buttons are the enemy of every dry cleaners. They typically crack when heat is applied to them (not necessarily from the force of the press). Some buttons are more susceptible to this than others, every shirt button is created differently. A quality dry cleaners will replace those broken buttons for free before you even get your shirt back (but hey, even the best ones miss one once and while which is why we created our button guarantee - if we miss a broken or missing button on your laundered shirts, we'll fix the broken button and clean two additional shirts for free!). Bring your Laundered Shirt in to Janet Davis Cleaners and we'll treat your shirts right. We're in Berkley, MI (across Woodward from Royal Oak Ford), Bloomfield, Michigan (at the Corner of Maple and Lahser) and your front door (with our free pickup & delivery service). this is the post i was looking for. no matter how careful you are with your shirts everyone face this problem, but now i know where to take my custom made shirts. keep up the good work.